Last week Couple’s Coordinates met up with Walks of Italy at the Basilica of Santa Croce for the Florence Food and Wine Tour. Fortunately for us, this was a walking tour, so we got to get a bit of exercise in to balance out all of the food and wine we consumed! Our tour guide, Laura, kicked off our day with a bit of history and education on the Piazza of Santa Croce as well as the Basilica. The beautiful cathedral is the principal Franciscan church in Florence and boasts sculptures of Dante and other famous Italian philosophers on the sides of the entrances. Learning a bit of history about the church was awesome as this building is the burial places of Michelangelo, Galileo, and Machiavelli. One fun fact we learned was that Pope Pius IV ordered that Michelangelo’s body be buried in Rome in St. Peter’s Basilica, but Michelangelo’s nephew Leonardo brought the corpse back to Florence, where it was buried in Santa Croce. Michelangelo’s body being buried in Florence is something that locals are quite happy to boast about. 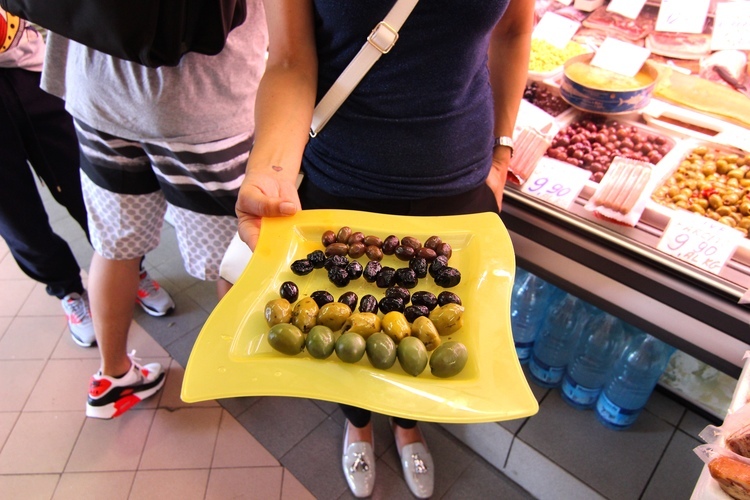 Our first stop was a local market in the Sant’Ambrogio area that has an amazing offering of food, jewelry, clothes, and much more! 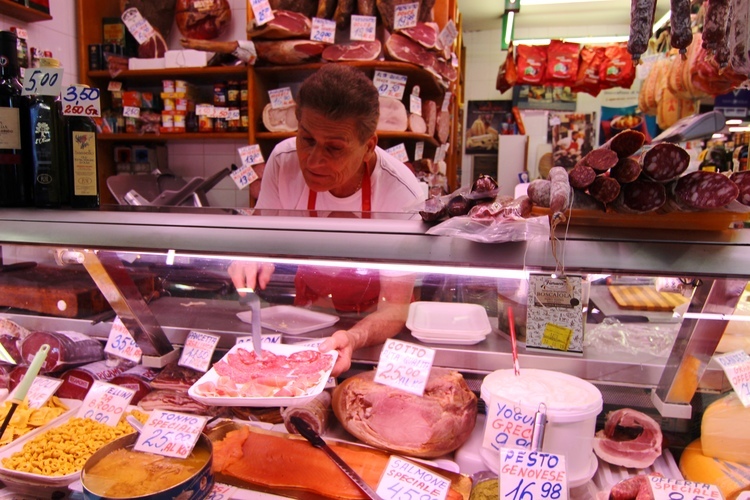 This place is fantastic if you have a kitchen while you’re in Florence and can cook, because the availability of meats, fish, cheeses, and fresh vegetables are seemingly endless. 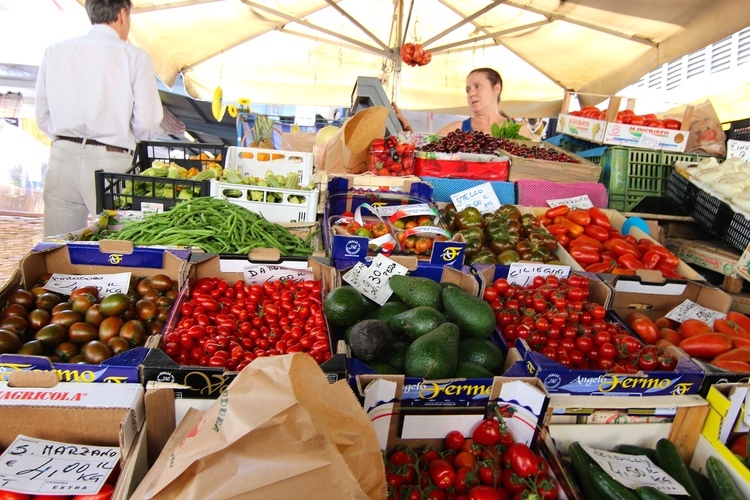 Everything here is farm to table, and you can only get what is in season in Italy. The food, wine, etc. all are pesticide and GMO free! We sampled olives, cured meats and cheeses; some of which had been aged almost 3 years! The local butcher even taught us about how prosciutto is cured differently in Parma and in Tuscany…we preferred the Tuscan style, but hey, we might also be biased. 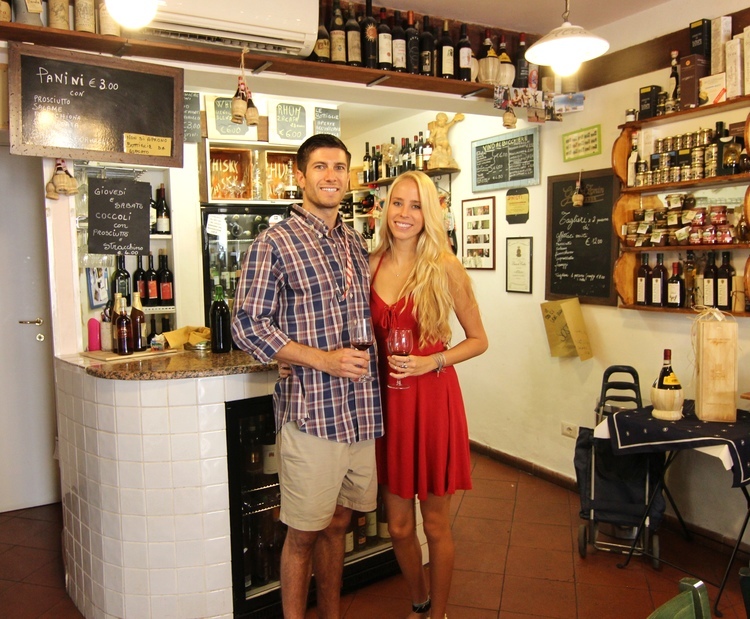 We went to a local enoteca that had “pour it yourself” wine tasting sfuso style. As you can see in the pictures, the wine is put straight into metal jugs, so you can pour whatever amount you desire into your glass. This stop also offered a lovely snack to pair with the wines! Samples of bruschetta, patte, crostini, etc. all complemented our wines very well. 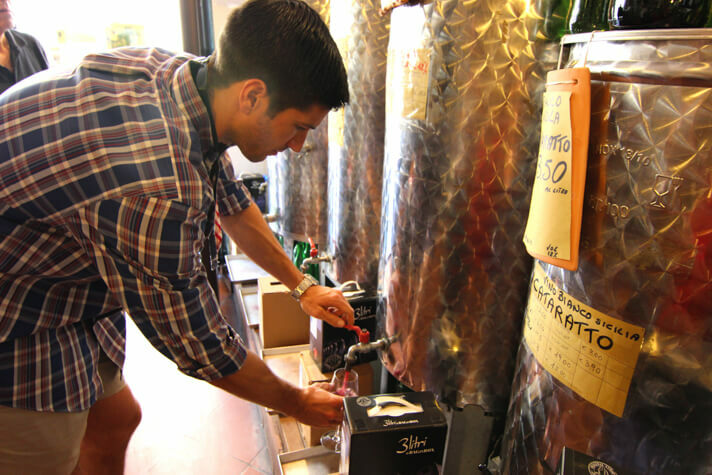 The owners of the enoteca were kind enough to put us to work a bit and teach us how to properly bottle wine with a machine that looks to have been in the family for generations! This was well needed after the generous wine tasting! For lunch, we headed back to the market of Sant’Ambrogio to a tiny restaurant called Trattoria da Rocco. 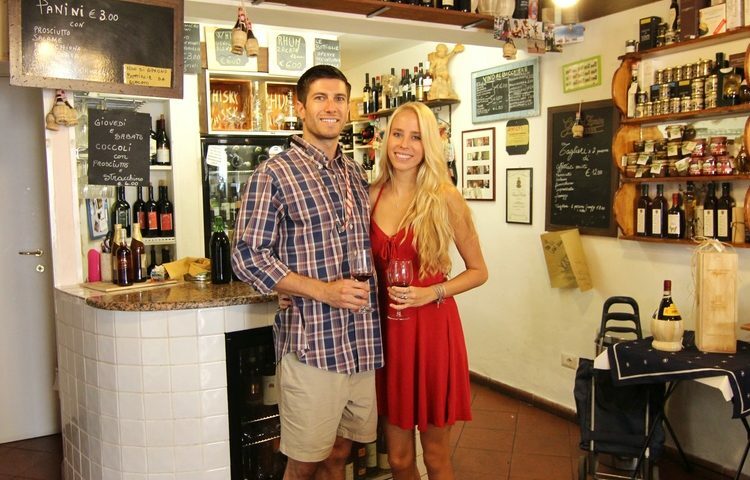 Here we had an awesome assortment of pastas, breads, olive oil, balsamic….oh and of course more wine! This spot is a great little lunch spot in the market and even offers pasta da asporto (pasta to go). 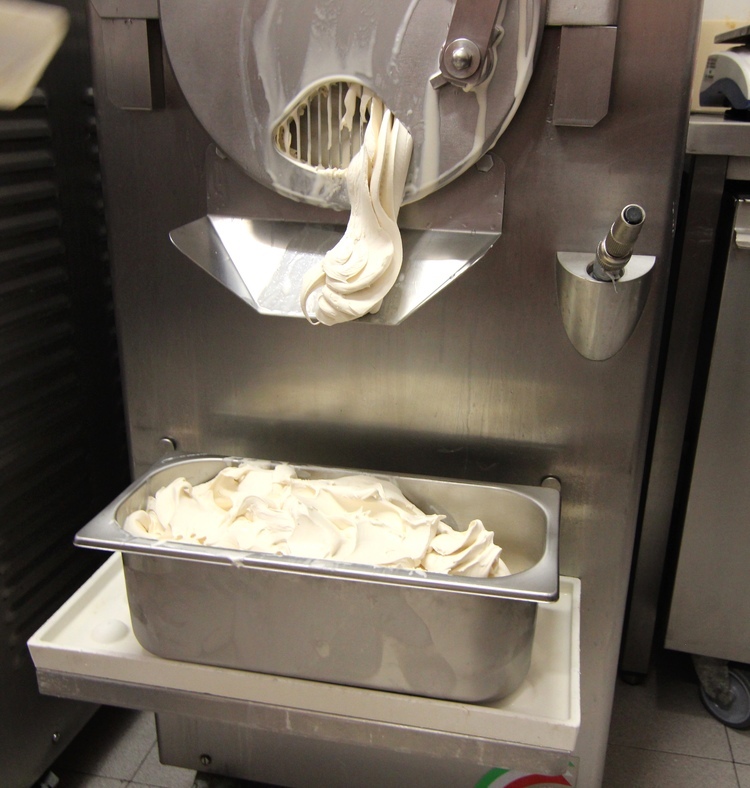 They’ll seal your pasta air tight so that it stays fresh for a few days. 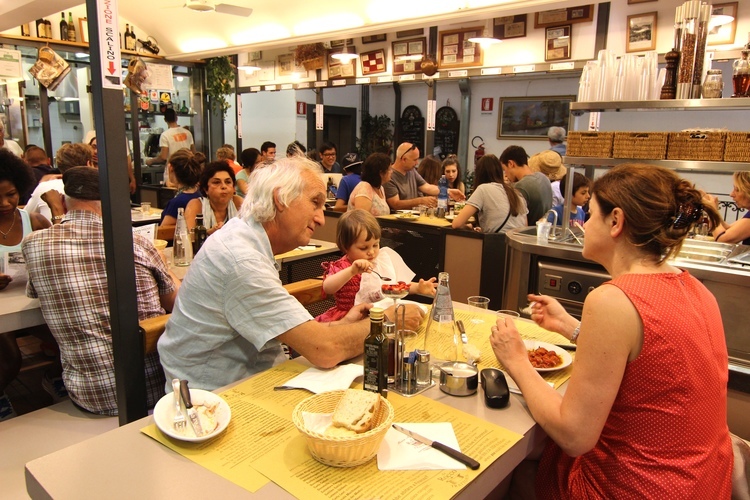 This little caffe seems to be quite a hot spot for Italian families and is a great spot for anyone traveling on a budget as the price points are very low. Because what good Italian food tour would be complete without gelato? One of Florence’s many claims to fame is that gelato was invented here! You all can thank the Medici family for needing a special dessert to enjoy and for the individuals who helped create it to please the royal family. This gelato trip, however, was much more than a traditional trip to a gelateria. Walks of Italy made sure to get us into the back of the gelateria to watch as the gelato was made by hand. The process and the ingredients are fairly simple, but all together, repeating this process from scratch each and every day is incredibly respectable. Il Procopio is the quaint gelateria we visited that is owned by a husband and wife who are the only workers. The wife serves the guests at the front and the husband makes the gelato in the back of the shop each day. 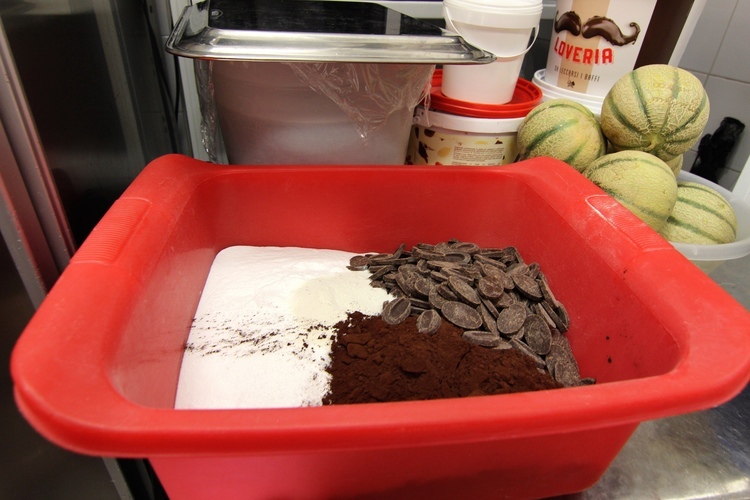 If you visit be sure to try their flavor that won the coveted 2011 Best Gelato Award! Michael made sure to order the famous “Il Procopio” which is a delicious blend of pistachios, candied orange peel, and almonds on top a bed of creamy gelato and Alex ordered the cheesecake con frutti di bosco (essentially cheesecake and mixed berries). 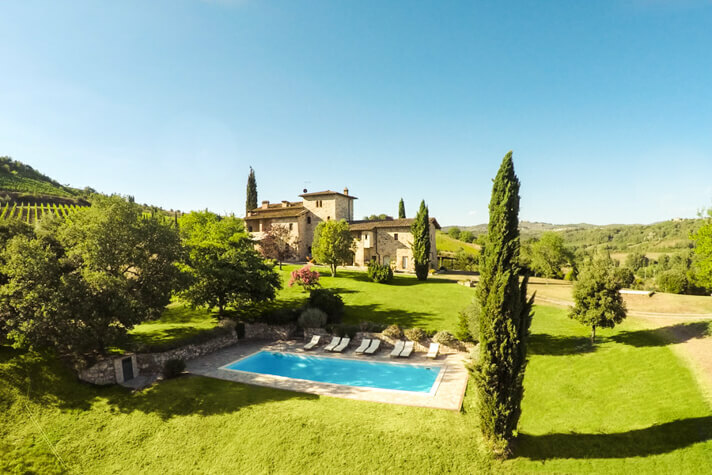 Couple’s Coordinates gives Walks of Italy an A+! The tour in and of itself is informative, fun, and delicious! 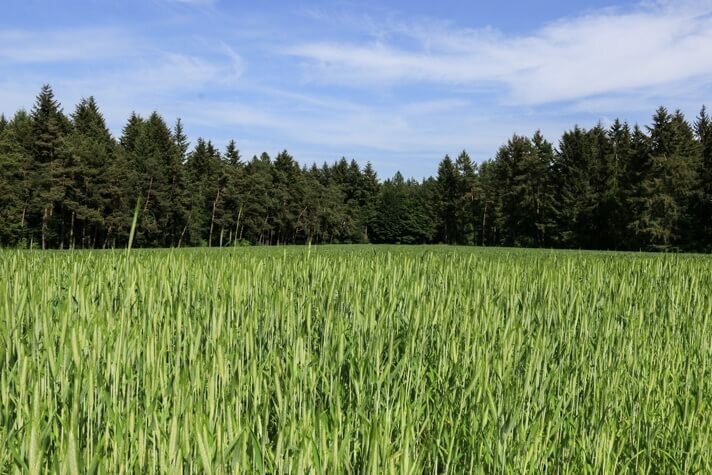 The tour guides are incredibly knowledgeable, and the groups are small and enjoyable. Be sure to check out Walks of Italy online here and follow them on Instagram @WalksOfItaly. What cities have your favorite food and wine tours? Let us know in the comments below! Hey! We are Michael and Alexandra! In 2015 we quit our jobs, bought a 1-way flight to Italy, and embarked upon our new life with only $8,000 to our names. Couple's Coordinates is our fairy tale adventure and your go-to destination for all things couples travel, city guides, travel tips, and romantic getaways. Subscribe to our mailing list and join over 100,000 readers! Surprise! 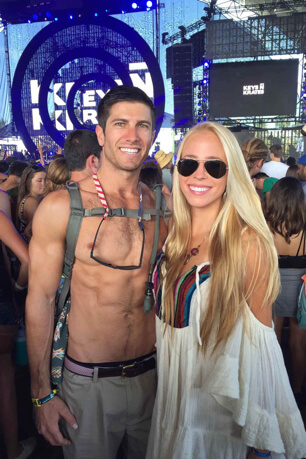 Couple’s Coordinates is Moving to Perth Australia!